The Olympus Tough TG-3 is a digital compact camera that is also part of the Tough range of cameras sporting full protection against water, sand and accidental dropping. Other desirable features include GPS and wifi built-in, stereo sound and a bright f/2 lens. In this full test, we discover how all those features and the 16 megapixel resolution work together. 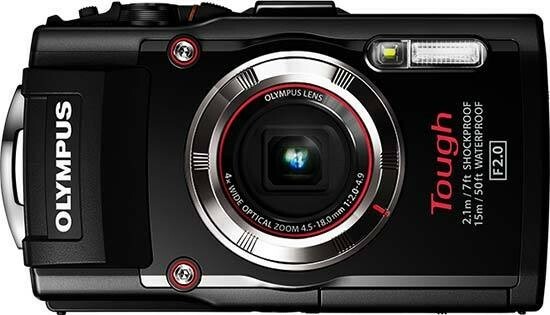 The Olympus Tough TG-3 is available in red or black and costs around £349 / $349. In the past, digital compact cameras needed large plastic boxes that surrounded the entire body before you could take any underwater pictures. Actual underwater cameras had large, thick bodies that protected against water and butter fingers. It can be argued that Olympus pioneered the camera that was fully protected yet also looked like a normal camera with the Tough series. Sadly, this saw off the celebrated Mju cameras as Olympus decided that a weatherproof camera wasn't as necessary in the market when they could amalgamate the best bits of Mju into Tough. The result of this union shows through in the latest offering in the Tough range, with the TG-3. From a distance, it looks like any other shockproof and waterproof compact camera with a chunky grip, pronounced buttons and oversized bezel. However, take the latter for example. The silver disc that surrounds the lens can be removed so that you can fix lens attachments to the camera such as an LED light guide and lens converters. The bezel is fitted with a rubber ring so when it's attached no liquid gets in which is a nice touch. These days it's all about how versatile the camera is and how much punishment it can take. The Olympus Tough TG-3 has an impressive specification. The lens has a fast f/2 aperture for better low light photography. It will mean allowing faster shutter speeds at lower ISO which is great for underwater where natural light is a premium. The zoom is at a modest 4x optical but given that a large zoom will reduce the quality of the image as it's at the extreme ends, that's not such a bad thing. On top of all that the sensor is a BSI CMOS. BSI stands for Back-Side Illuminated and refers to the way the sensor is built. Traditional sensors have circuitry surrounding each pixel which transports the information to the processor. On a BSI sensor (sometimes referred to as a back-illuminated sensor) the circuitry is placed on the back of the sensor which frees up space and allows more light onto the pixels. To view the sensor when fitted in the camera, it looks as though it's on backwards, so the back would be illuminated with light when taking a photo if it was a normal sensor. As we mentioned, the advantage is more light falling on the sensor which means it's more responsive in low light and helps reduce noise. The new TruePic VII processor can also adapt its operations according to the settings you have on the camera at the time. Clearly the Olympus Tough TG-3 has been designed around extensive travel use because it has been fitted with GPS and wifi and there's also an e.compass feature. If you're unfamiliar with how GPS can help you, it will record the times you took a picture and where you were. The camera will then match that information up with the photograph taken at that time and you can place it on an online map, such as Google Maps. The e.compass is a compass that appears on the back of the screen allowing you to get your bearings and will also show longitude and latitude. It will work even if the camera is powered off. More and more people wish to be creative in their photography and not just by sticking an Instagram style filter over it. Those filters are available if you wish to use them and the Olympus ones are some of the better ones on the market. The TG-3 also offers Interval shooting and Time-Lapse video. The latter will take a succession of images over a pre-determined time period and make it into a video for you. Interval shooting does pretty much the same thing, but they remain as separate images. The back of the Olympus Tough TG-3 is styled on a traditional digital compact camera with smaller buttons. That could be problematic when using the camera underwater. The dial to the right is operated by the thumb and we found that even though it's not easy to move around, it could still find it's way into other modes. There are a couple of interesting modes to look at, though, such as the Microscope mode which allows a super-macro focusing of 1cm. However, given that some cameras do that as standard, it seems odd that Olympus have made a new mode for it. There's also a Photostory mode which will take three images and combine them into a modern looking layout of one large image and two smaller ones. The 3 inch LCD screen benefits from various display options by pressing the Info button situated to the right of it. One of the options is to have the Function menu listed down the right side of the screen. You can access this by pressing the OK button or the left, right, up and down of the navigation pad. Pressing certain ones will open the menu up at the function they operate. For example, if you press the right button which is flash options, the Function menu opens up on Flash. The left button has no designation so will open at the top of the page, as will pressing OK. You can scroll to the bottom of the Function menu to access the Main menu or if that is too much repetitive movement, you can access it via the MENU button towards the bottom of the camera. Olympus have split the Main menu into four separate sections: Camera, Video, Playback and Set-up. There are multiple pages of some sections to make what looks to be a highly comprehensive menu system. However, some of the pages may only have three or four options. Starting the Olympus Tough TG-3 up from cold, it takes around 1.6sec. That's marginally faster than some of the faster speeds of around 1.8sec that we've seen. This is arguably put down to the lack of having to extend a lens from a closed position. There are three continuous shooting modes: Sequential, Hi1 and Hi2. Sequential shooting is pretty fast without the burst modes. It shoots a fast sequence of images for the first two seconds and can get up to 15 images in that time period giving an average of 7.5fps (frames per second). We tested the camera over a ten second period and the camera managed to take another two images in that time. It takes the camera 30 seconds to download the images to the card before you can view them. Hi1 runs at around 15fps for a period of six seconds, while Hi2 runs at around 50fps and will shoot for a maximum of two seconds. Both of these settings knock the resolution down to 3 megapixels. You can review pictures you've taken at any time and – like the e.compass – that includes when it's switched off. Simply press and hold the playback button until it springs into life. The most recently taken image will be shown first. If it was part of a sequential shoot, the sequence will appear as a group. You can drill down into them by using the zoom switch on top of the camera. On a single shot, the zoom works as a zoom to see a portion of the picture close up. The INFO button will show three different amounts of information with the picture. The most being all shoot information such as ISO, resolution, aperture, shutter speed, shooting mode and a histogram. The menu shows nothing different, it's the same as when you're in shooting mode, but it goes straight to the Playback section. The Olympus Tough TG-3's box is split into two sections. The top section has a thick booklet which is essentially a Quick Start Guide, called the Basic Manual. It's primary role is to get you started and has the instructions in 29 languages. The full instruction manual is on the enclosed CD which also holds Olympus Viewer 3. A useful system for looking at, editing and tagging your pictures if you have no other program. The bottom section holds the camera, a lithium ion battery, long, durable looking camera strap and the charger. The charger is the only area we can see that the TG-3 is let down in terms of being a travellers camera. It comes in three sections using the USB cable, charging unit and a figure 8 lead. That's a lot of additional stuff to carry while moving around.